The aji amarillo is a member of capsicum baccatum, one of the five domesticated pepper species, and is grown all over Peru. The aji amarillo—aji means chili pepper and amarillo means yellow in Spanish—is considered part of the Peruvian "holy trinity" when it comes to their cuisine, along with garlic and red onion. Although this pepper is literally named "yellow chili pepper," its color changes to a bright orange as it matures. The chili pods have a thick skin, are 4 to 5 inches long, and are considered hot (it is 30,000 to 50,000 on the Scoville Heat unit scale). But the aji amarillo balances that heat with a bit of fruity flavor. Smelling a bit like a raisin, this chili's taste is somewhat subtle with hints of passion fruit and mango, imparting a unique flavor to any dish. The famous Peruvian chef Gastón Acurio named this spicy, fruity chili pepper the most important ingredient in Peruvian cooking. Aji amarillo is used in many classic Peruvian dishes, such as causa rellena and papa a la huancaína. 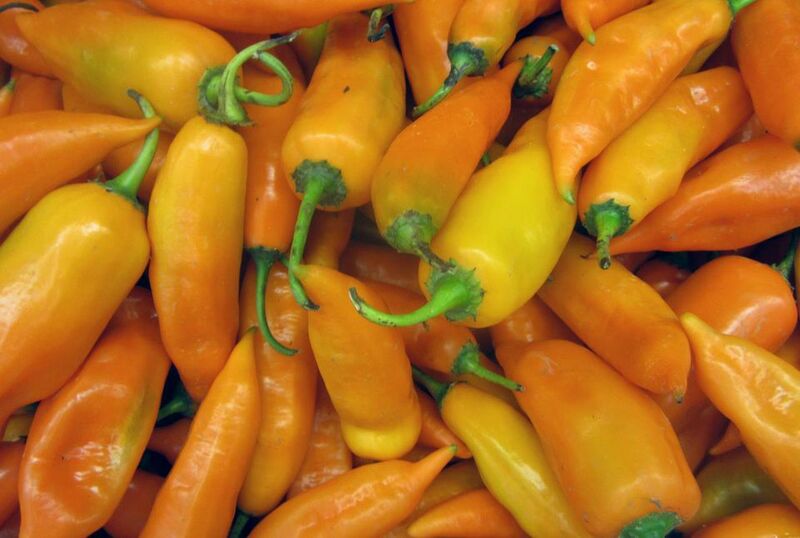 Aji amarillo is also used in many sauces, where it adds a bright complex flavor as well as its distinctive yellow/orange color. It is most often incorporated in ceviche, combined with root vegetables, and employed to give seafood dishes a bit of zip. Other important chile peppers used in Peruvian cuisine include aji panca, a dark red chile pepper with a smoky flavor, and rocoto, a fiery hot red pepper that resembles a small bell pepper. If you can't find fresh aji amarillo in your produce section, look for frozen aji peppers, dried peppers (in the spice section), or jarred aji amarillo paste in Peruvian grocery stores or in the Peruvian section of a Latin American grocery. The fresh or frozen aji amarillo chilis can replace more traditional chilis in Mexican dishes that call for a spicy chili. The dried peppers can be ground up and used as part of a chili powder or spice rub. The chili paste can be mixed into rice or sauces for an unexpected flavor. If you live in a warm climate, you can grow your own aji amarillo. These peppers need the same growing conditions as other chilis and can be placed in planters as long as they get a lot of sun. They will grow to be about 5 feet tall and each plant produces roughly 40 peppers. They do take about 4 months to mature, however, so you will need a bit of patience. Once they are ready you can use fresh or dry them. Aji amarillo adds spice, interesting flavor, and a beautiful golden color to a dish. Make a simple ají amarillo sauce (crema de ají) to serve with roasted chicken, vegetables, and even French fries. Papa a la huancaína, potatoes in spicy cheese sauce, will be an unexpected side dish at dinner this week. A delicious layered meal in one is causa rellena con pollo, yellow mashed potatoes with chicken salad and avocado.